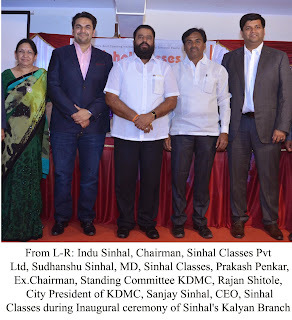 MUMBAI: By opening their branch in Kalyan, Mumbai's prestigious Sinhal Classes made a point that - quality education, revolutionary teaching methods and practices will no longer be a privilege of the Western suburbanites and the South Mumbaikars. Sinhal Classes entered the Kalyan Dombivli belt by storm with the opening of its new branch at Kalyan on 22 January 2015. The grapevine suggests that the Kalyan branch is part of a larger corporate expansion plan that is unfolding itself at Sinhal Classes with new centres mushrooming almost every two months. The opening of the Kharghar branch of Sinhal Classes as recently as the first week of December, is a case in point. International management consultants Mckinsey have identified the education sector as a key growth area in India over the next two decades. And brands like Sinhals are only a clear reflection of the writing on the wall. The recently launched IIT division of Sinhal Classes also received an overwhelming response in its very first year. "With the opening of our Centre here, students from Kalyan are also getting their first IIT Coaching Centre here," said Sudhanshu Sinhal, Managing Director, Sinhal Classes. "As the first step to provide affordable education to all, we are using this opportunity to donate books to the students of the KDMC School," he added while distributing the study materials to the students of class 10. While making their foot print in Kalyan Dombivli area, Sinhal Classes will also donate study materials for all the students from Standard 10 in Kalyan Dombivli Municipal Corporation School. This exercise is done as a part of their CSR activity while opening their centre in the area. "I am glad that the children of Late Prof. O.P. Sinhal have taken the way forward for Sinhal Classes in the right path while there is an extreme need for quality education and institutes like Sinhal Classes are very much in need in Kalyan," opined Mr. rajan Shitole, City President, KDMC. Speaking at the occasion, said Mr. Sanjay Sinhal, CEO, Sinhal Classes, "On the occasion of the opening of this 21 classroom facility here, with immense pleasure I can say that we have always believed in providing quality and affordable education to all students." Mrs. Indu Sinhal, Chairman Sinhal classes and Mr. Prakash Penkar, Ex-Chairman of the Standing Committee, KDMC were also amongst other dignitaries present at the inaugural ceremony. The Group with 33 years of experience in the field of coaching students aims to fuel its expansion through franchise-investment model and is already in talks with several business houses, schools and entrepreneurs for the same. Sinhal Classes Pvt. Ltd is engaged in promoting quality education in India. Sinhal Classes owns and manages 16 extremely successful coaching locations in Mumbai by the name of "Sinhal Classes" and has the distinction of mentoring more than 8000 students every year of class IX, X (CBSE/ICSE and SSC Board) and prepare students of class XI & XII for JEE-MAINS, MEDICAL and IIT Entrance Examinations. The institution was established with an objective to empower Indian Students to build stronger concepts and make them more confident to face any academic challenges in the future. Sinhal Classes is now the most trusted choice of students and has grown manifold with thousands of top ranking students passing through its portals each year. No Comment to " Sinhal Classes takes the central suburbs by storm with their Kalyan Branch opening "